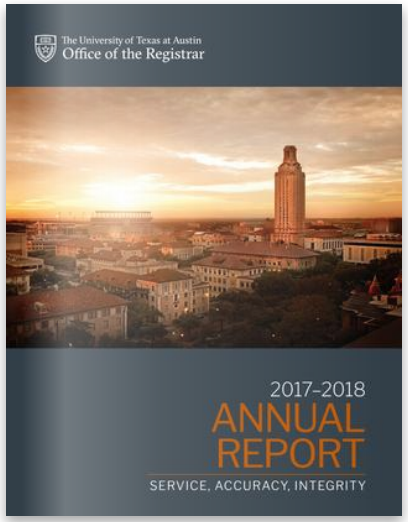 The mission of the Office of the Registrar at the University of Texas at Austin is to create, maintain, certify, and protect University records of courses, degrees, and students. To meet that mission, we express below our vision and values, the key components of our work, our most recent progress -- and the goals we've identified for the future. earn national respect for excellence in academic services and our use of technology to benefit our campus and the higher education community. teamwork, to foster a collaborative work environment and coordinate the intricacies of our collective mission. To learn about the progress we've made in our collaborative efforts and strategic initiatives, view our 2017 - 2018 Annual Report. 2016-2017 Annual Report, 2015-2016 Annual Report, 2014-2015 Annual Report, 2013-2014 Annual Report, 2012-2013 annual report, 2011-2012 annual report, 2010-2011 annual report or 2009-2010 annual report. View our office-wide goals and initiatives in our 2017- 2020 Strategic Plan.